Rav Romirowsky studied in the Yeshiva of Novoradok. 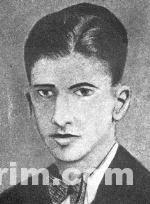 After completion of his studies there he was sent to the town of Gorodische (about 60 miles southwest of his hometown of Lida, Lithuania) to continue his studies on his own. 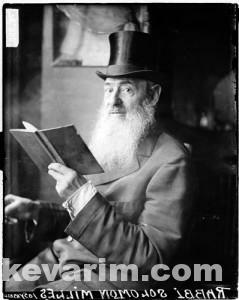 The Chofetz Chaim came to the city and to the shul there. He saw that while there were minyanim, there were no shiurim (classes) for the laymen of the town. He asked the town’s Rabbi to institute such classes. 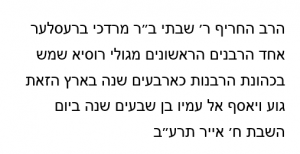 The Rabbi agreed with the need, but protested that there was no one to conduct them (it was at that time not considered proper for the Rabbi to do so). 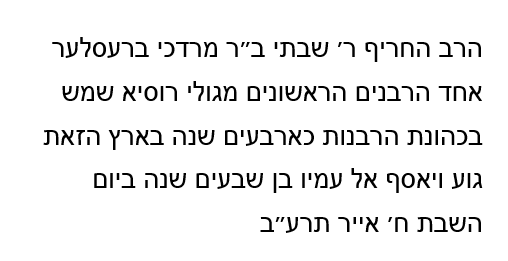 The Chofetz Chaim answered that surely the yeshiva bochur learning there (Shmuel) could do so. 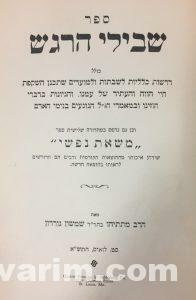 Shmuel then began giving a shiur in agadata (the non-legal portions of the Talmud). 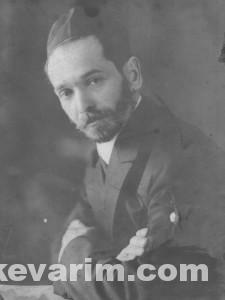 The Chofetz Chaim himself initially attended to encourage the others to join. Dovid Abba Perlman (sister of Shmuel’s future mother-in-law Meita Leah Perlman Rubinstein) traveled periodically to Gorodische on business and came to the shul there where he became acquainted with Shmuel and was impressed with him. 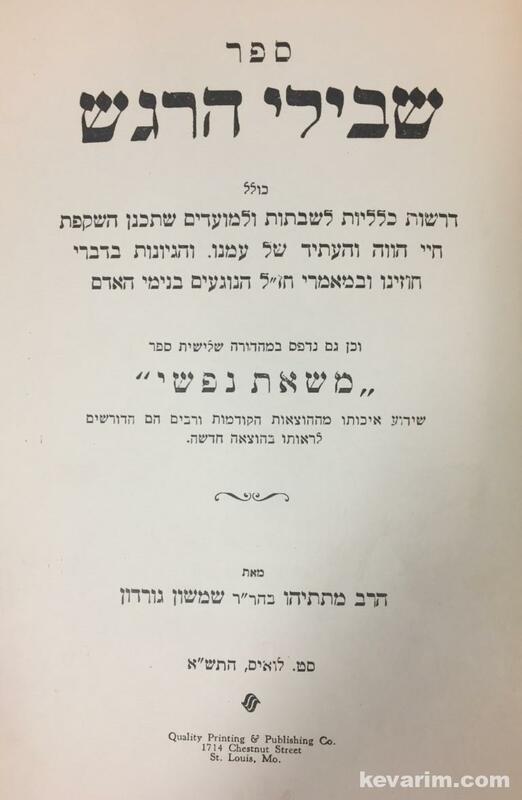 He therefore suggested him as a potential shidduch (match) for his niece, the 16 year old Sarah Rivka, daughter of the late Yosef Leib Rubinstein of Snov (on the outskirts of Baranovitch). 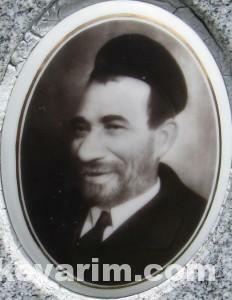 Shmuel came to Snov to observe Sarah Rivka whle working in the family’s cantina (bar or liqueur store) run by widowed mother. They were married in 1888 or 1889 in Baranovitch, the larger city near Snov. Shmuel was ordained as a rabbi by Rabbi Yitzchok Elchonon Spector, the Kovner Rov, and after marriage spent 10 years learning in Vilna in the Gaon’s kloiz supported by his mother-in-law. After that time, he accepted a teaching position as a private tutor in Uman, Russia where he taught the children of the Freidenburg family who were university students. He taught there for 9 years after which he accepted a position as a fundraiser to collect money in America for the Kovno Kollel. This position was to last 2 years. He left for America in 1911, leaving his wife and 10 children in Snov. He traveled in the US raising the funds he was sent to collect. He was to return to Russia in 1914, but he then received a letter informing him that his daughter Ida was on her way to the US. He waited for her and then for his son Jack (Yona) who came shortly thereafter. 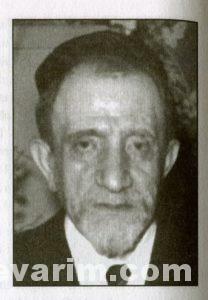 World War I broke out followed by the Bolshevik Revolution and he was unable to return to Russia. 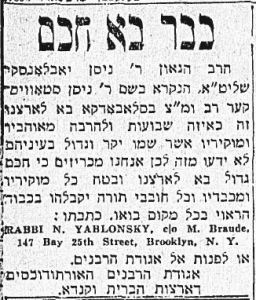 Friends of his in Chicago convinced him to settle there and found him his first rabbinic position in America as the Rabbi of the Lukniker Shul on 14th Street. 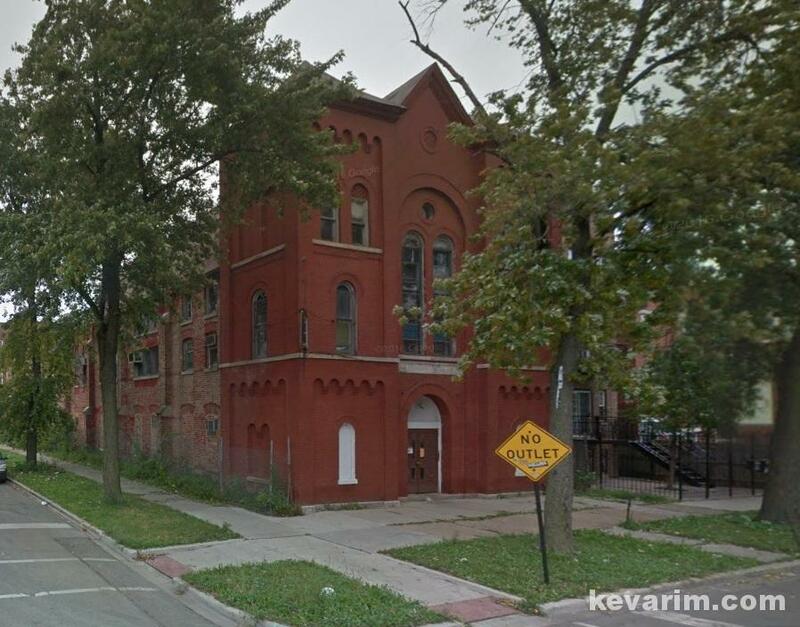 He remained there for 2 years until 1917 when he became Rabbi of Bnai Israel First Congregation of Englewood on 61st Strete & Aberdeen where he served until his death. Once he realized he would be unable to return to Russia, he began to try to bring his family to the US. From 191 to 1921 though, he was unable to make contact with them. 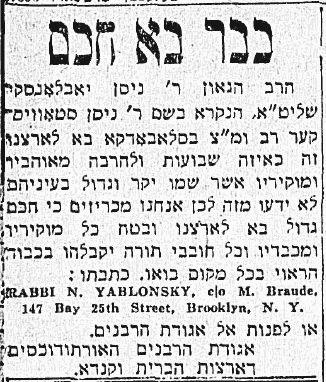 Finally, during the winter of 1921, the family in Snov received a telegram from him followed by other communications resulting in their emigration to the US. 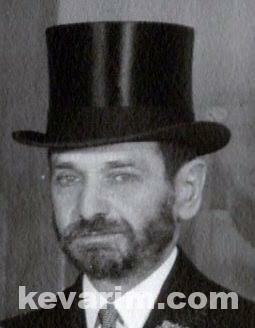 He was a prominent Rabbi in Chicago. There were numerous obituaries written about him (copies are in possession of our family) in the local Yiddish press. 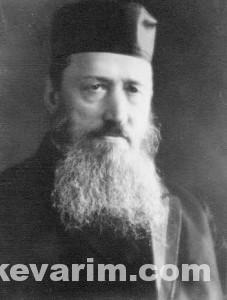 He was succeeded as Rav of the shul by his son Rabbi Eliezer Moshe Romirowsky. 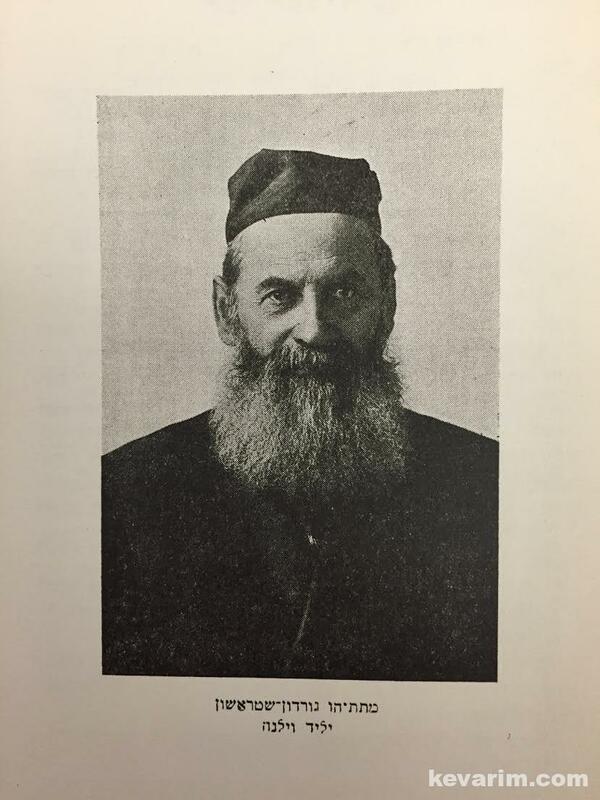 One of his sons-in-law, Rabbi Avrohom Yitzchok Perlstein (see picture below) was an av beis din in Chicago as well as the rav of the Tzemach Tzedek shul there. 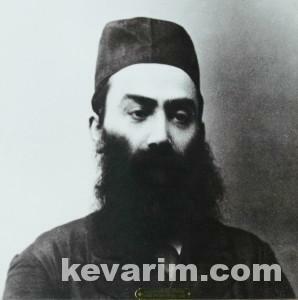 Rav Shach was born in Khvidan near Kovno and was a member of the famed Kovno Kollel under Rav Yitzchak Elchanan Spector. 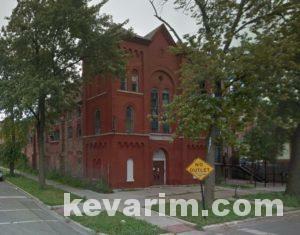 In 1907, the Rav arrived in Chicago where he was appointed rabbi in the Drohitchin synagogue and later the Kehillat Yaakov synagogue. 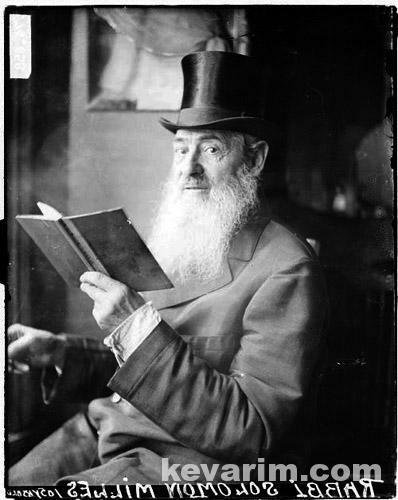 In Chicago he earned a reputation of having sharp understanding and expertise in Talmud and enjoyed a good relationship with the community.